Sheriff’s officials in Adams County said today (Friday), a 78-year old man died Wednesday, after falling off a grain bin near Prescott. The unidentified man apparently lost his footing and fell to the ground. Authorities say he was unresponsive when a deputy and rescue personnel from Corning and Prescott arrived on the scene. The man was later pronounced dead by the Adams County Coroner. The incident, which took place about a mile northeast of Prescott at 1823 Quince Avenue, was reported at around 9:24-a.m., Wednesday. Iowa Senator Joni Ernst says she called out U-S Ag Secretary Tom Vilsack over the happy picture his department is portraying when it comes to the current state of the farm economy. “A week or so back he had met with a group and was trying to paints a very rosy picture of the farm economy — but that’s not what I am hearing — and I really did press him on that issue,” Ernst says. Ernst says her concern is the U-S-D-A regulations and programs aren’t helping smaller farmers. “He tried to tout a number of programs that U-S-D-A has, but again I think the things that they promote — the GIPSA (Grain Inspection, Packers & Stockyards Administration Rule) is a great example of that — it really does inhibit some of those small beginning farmers from even getting a fair start,” Ernst says. Ernst was asked if Vilsack is doing a good job as Ag Secretary. She focused her answer on the department and not Vilsack. “I’m not going to say yes or no about his role as ag secretary,” Ernst says. “But what I will say is that I think U-S-D-A as a whole is trying to paint an optimistic rosy picture of what is going on, but in reality that is not what is going on. And I hear that every day in Iowa.” Ernst says farmers need less government regulation not more. She referred back to the GIPSA Rule. “What I fear is that this will cut out those small farmers, those small operations, they won’t be able to engage in the contracts like we see some of the larger packers doing. So, this is an issue that has been brought up by the Iowa Pork Producers, they have spoken to me about this, they have great concerns there. As, well as some of those packing houses,” according to Ernst. She says the packing houses want to have a supply of livestock from a variety of sources and are worried the rule will prevent that. Ernst made her comments during her weekly conference call with reporters. If you’ve got walnut trees and some time to rake up the walnuts that fall from them, you can make a little money from the State Forest Nursery. Nursery spokesperson Candace Weigel says they collect walnuts every year to grow into thousands of seedlings. They are a little short on their seed supply this year. “This year and last year there’s been kind of a short of walnut seed, so we are having enough trouble getting enough walnuts to fulfill the walnut seedlings that we need to supply for the state,” Weigel says. She says the walnut shortage is something that happens from time-to-time. She says seeds on trees tend to be cyclical as walnuts are prolific some years and other years are down. Weigel says that happens with other species too such as oaks. Weigel says they will pay you two dollars, 50 cents for each bushel of walnuts you bring to collection sites around the state. “Just the native black walnut, which most trees are around here,” Weigel says. “If you know that you have an English walnut, then we don’t want that, just the native black walnut.” Weigel says the walnuts should be fresh and in good condition, free of debris like sticks and leaves. The seed can just be in buckets, or loose in a pickup bed or trailer. And the hulls can be left on,” she says. Weigel says most people don’t do anything with the walnuts that fall off their trees. “Most of the walnuts will just be left for the animals and the squirrels bury some of them and they will grow up and produce little walnut seedlings,” according to Weigel. “Some people do collect them and crack them completely open and do eat the black walnut.” You can sell your walnuts at the State Forest Nursery in Ames (800-865-2477), Shimek State Forest (319-878-3811) in Farmington, Stephens State Forest (641-774-4559) in Chariton and Yellow River State Forest (563-586-2090) in Harpers Ferry. Weigel says you should call first to schedule a time to drop off walnuts to be sure someone will be there to collect them and pay you. 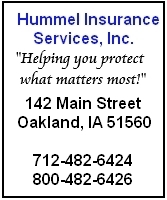 DES MOINES, Iowa (AP) — A new consortium of environmental groups is asking Gov. Terry Branstad to support a statewide moratorium on new and expanded hog confinement operations because of polluted waterways. The Iowa Alliance for Responsible Agriculture announced itself at a Wednesday Capitol news conference and sought Branstad’s backing. The alliance, which includes more than 20 groups, wants the moratorium in place until the state improves water quality in its lakes and streams. Alliance members blame hog confinements for polluting waterways and creating health problems for nearby residents. Branstad spokesman Ben Hammes rejected the alliance’s proposal, calling it an “extreme” plan that would hurt agriculture and Iowa’s economy. The alliance is separate from the recently formed Iowa’s Water and Land Legacy Coalition, comprised of agriculture, business and conservation groups that support increasing the sales tax to fund natural resource programs. 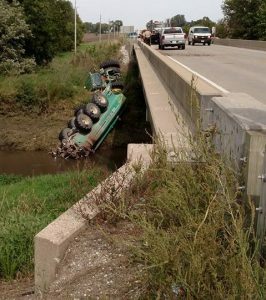 One person suffered what were described as non-life threatening injuries during an accident southwest of Atlantic Wednesday afternoon.Cass County Chief Deputy Sheriff John Westering told KJAN News a John Deere 8310-R tractor hauling an empty liquid manure hauler/spreader, was traveling north on Highway 6 at around 12:48-p.m., when part of the trailer clipped east side the Trooper Stanley Gerling Memorial Bridge, over Turkey Creek, about a mile south of Memphis Road. 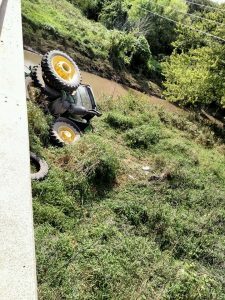 The impact caused the both the tractor and tanker to go out of control and crash into the concrete bridge railing on the west side of the bridge. 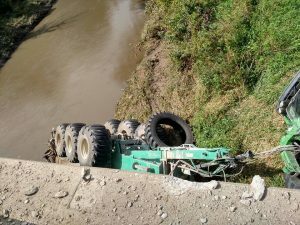 The tractor and tanker went over the concrete railing and toppled about 25 feet, with tractor ending up on the north side of the ditch and part of the tanker in the creek. 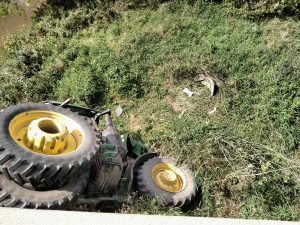 The driver of the tractor, 31-year-old Timothy McFarland, of Waukee, was freed from the machine by non-mechanical means and was said to be up and walking around. He was transported to the Cass County Memorial Hospital by Medivac Ambulance. 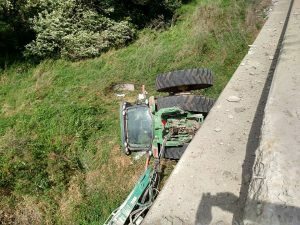 The tractor was considered a total loss. The accident remains under investigation. A workshop is being held in central Iowa today (Wednesday) to help communities find the needed resources to help redevelop and revitalize areas that may have environmental contamination. Mel Pins, spokesman for the Iowa Department of Natural Resources, says the workshop is focused on what are known as “brownfield” areas, and he offers an example. The D-N-R workshop is underway at the Octagon Center for the Arts in Ames. The head of the Iowa DNR’s State Forest section is predicting an “average” year for fall colors. Jeff Goerndt is hoping he’s wrong, but says recent wet and cool conditions may not result in the best and brightest show for leaf watchers. “We’re really keeping an eye on northeast Iowa, where we typically have our best fall color. We’ve had some really heavy rain, storm events and flooding in that area. There’s more cooler and wet weather forecast for that area and that’s not necessarily the best recipe for good fall color,” Goerndt says. Northeast Iowa has an abundance of hard maple trees, which supply bright red and orange colors. Goerndt suggests the Loess Hills in western Iowa offer a completely different, yet equally stunning, fall look. Leaves typically change first across northern Iowa between the last week of September to the second week of October. Central and southern Iowa generally change color between mid to late October. The annual fall color show is a big tourist attraction for many cities and towns around the state. 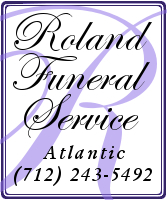 “Folks like to visit our state parks and state forest areas, especially the areas around the larger reservoirs with a lot of trees. Also, if you get out there and drive those scenic byways around the state, those are great places to view fall color,” Goerndt says. 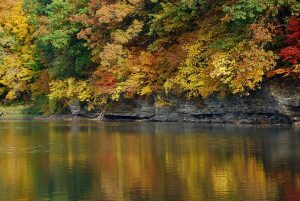 Weekly updates on fall color information can be found at iowadnr.gov/fallcolor. To qualify, the unpicked corn rows must be nearest to the road and the D-O-T will only compensate farmers for up to 16 rows. There’s no official deadline date for farmers to join, but he says they like to have all the information ready by the time harvest starts — by the first or second week of October.